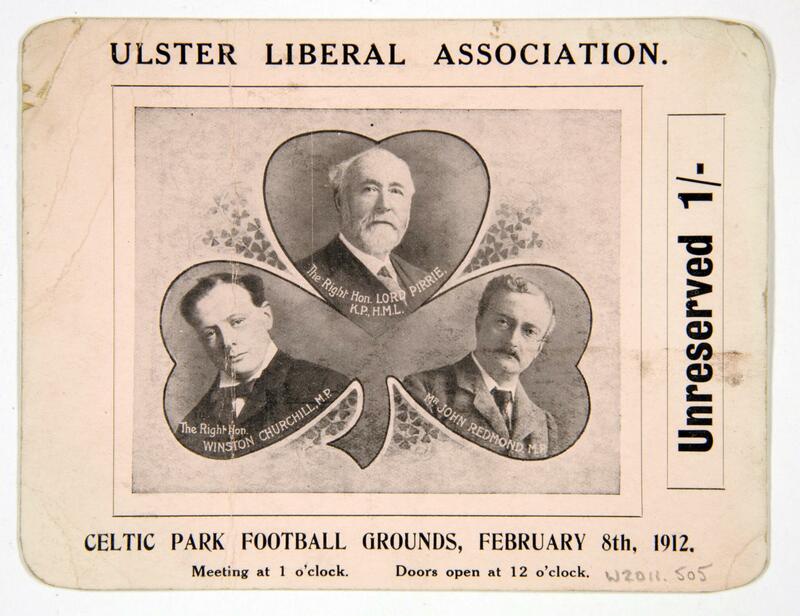 Unreserved ticket, costing one shilling, for a public meeting held at Celtic Park Football Grounds on 8th February 1912 under the auspices of the Ulster Liberal Association. This pro-Home Rule meeting in its new location at Belfast’s Celtic Park football ground on 8th February 1912. The meeting was supposed to take place in the Ulster Hall but had to be quickly rescheduled after some Unionists threatened to use force in order to prevent it being held at this city centre venue. The ticket shows the main platform speakers – from left to right: Winston Churchill (Liberal MP), William Pirrie (Chairman of Harland & Wolff), and John Redmond. Churchill, who spoke in favour of Home Rule, was mobbed by angry Unionists at the port of Belfast on his departure from the city.